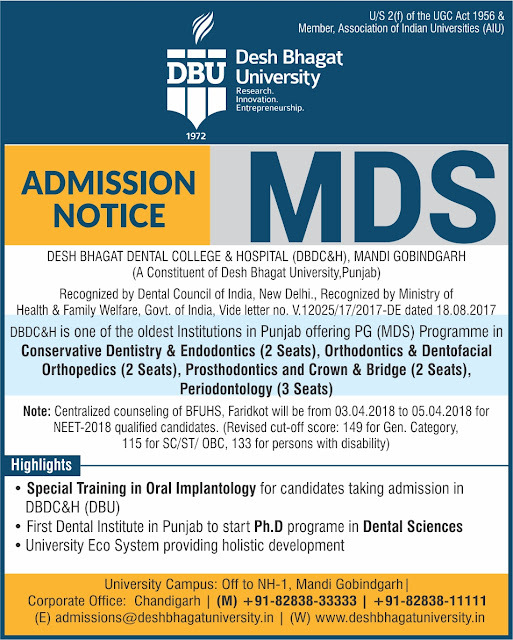 Desh Bhagat Dental College & Hospital, Mandi Gobindgarh, a constituent of Desh Bhagat University has got permission to admit students in MDS Course for the academic session 2018-19. 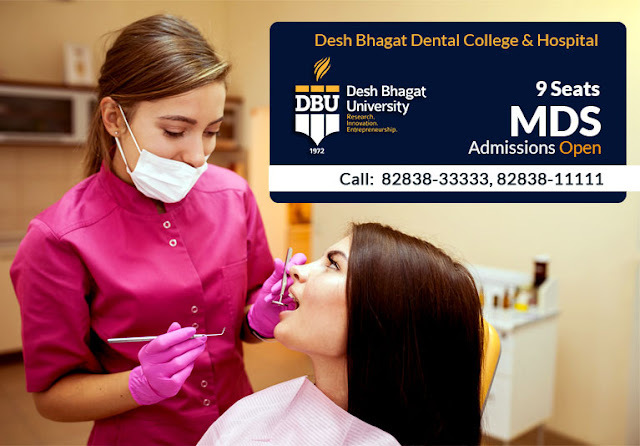 The Dental Council of India (DCI) & Government of India (Ministry of Health & Family Welfare) have approved the proposal of Desh Bhagat Dental College for granting 9 seats in Master of Dental Surgery (MDS) course to meet the higher education needs of the Bachelor of Dental Surgery (BDS) graduates. 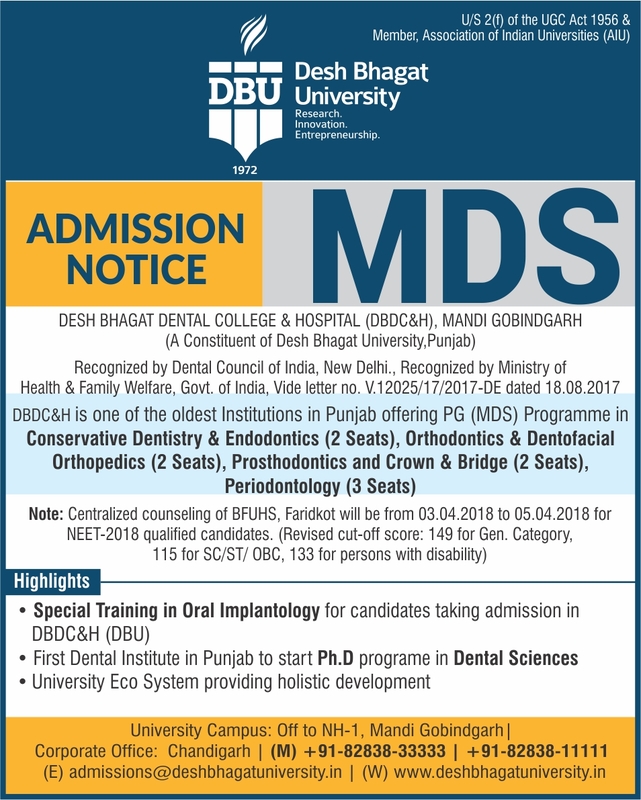 Disclosing this, Dr. Zora Singh, Chairman, Desh Bhagat United said, ‘The Central Government has accepted the recommendation of DCI and conveyed its approval to allow admitting the batch of students in MDS course in the specialty of Orthodontics & Dentofacial Orthopedics (2 seats), Conservative Dentistry & Endodontics (2 seats), Prosthodontics and crown & Bridge (2 seats) vide letter number No.V.12017/10/2017-DE(Pt.VI) dt. 27.2.2018 and Periodontology (3 seats) vide Letter No.V.12017/10/2017-DE(Pt.V) dt. 21.2.2018, for the academic session 2018-19. The Govt of Punjab gave the accent for 9 MDS seats vide letter No.2/59/2016-3MER-III/1310 dt.19.3.2018. However the counseling for these seats will be done by Baba Farid University of Health Sciences on 5 April 2018 for all post graduate dental institutes of the state including those of private universities. He further told that DBDC & H after shifting from Sri Muktsar Sahib to Mandi Gobindgarh in the campus of DBU is affiliated to Desh Bhagat University. Dr. Singh expressed his gratitude to the Government of India & DCI and Govt. of Punjab for granting the approval. He congratulated the Management, Principal, Staff and Students of the Institute for this achievement and also thanked all those who extended their support to this endeavour. 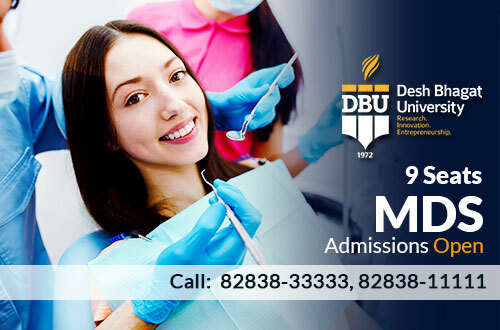 First Dental Institute in Punjab to Start Ph.D programme in Dental Sciences. University ECO system providing holistic development.